3. Notary History to learn how notary powers have changed since Ancient Egypt, Greece, Rome, Medieval Europe, Spanish explorers, Colonial America and Colorado Territory. 3. Apply online to the Colorado Secretary of State (SOS), $10 application fee. Attach notarized affirmation, training course certificate, exam certificate. We also provide customer support for our notary training students to help you become a notary or a better notary. Just call us or send an email when you have a notary question. Training in Denver, Aurora, Castle Rock, Woodland Park, Canon City, Salida, Walsenburg, Trinidad, Alamosa, La Junta, other cities available by arrangement. Call to schedule training. Training location is subject to change to a different location to reduce student travel time. Note: Notary training classes require 2 students minimum. If a minimum number of students do not register, or due to bad weather, or emergency, the instructor may cancel, change location or change to teleconference training. Terms of cancellation, refund and rescheduling are stated in Fee Schedule. Choose a notary training date, then register in Section 2. For private notary training, see Section 4. For teleconference information, see Section 5. For training course description, see Section 7. > Note: July 1, 2018 New Revised Uniform Law on Notarial Acts (RULONA) laws effective. All notaries must know and follow new RULONA notary laws. Notice: Follow Colorado House Bill HB 19-1167, Remote Notaries Protect Privacy in the state legislature. Status: Passed House vote 49-14 on April 3, 2019, pending Senate approval. Total notary training cost: $40, includes tuition, 36-page student booklet, notary exam study guide and training class completion certificate. Optional fee: Pay instructor $5 in class to Notarize your Colorado Notary affirmation form. Bring your affirmation form to class. Notary journals from the American Association of Notaries (AAN) are available at order notary journal online. complete STEP 1 and STEP 2 below. Click Register Now button to complete student registration form. Enter your information in the boxes below, then click on PAY NOW to pay with a credit or debit card, or bank funds transfer. You will receive an email receipt from PayPal. Your email receipt is your payment confirmation. Print out the driving directions and map so that you can find the class location. Thank you. We offer live Colorado Notary Training classes in Colorado Springs, Denver, Pueblo and other cities on request. 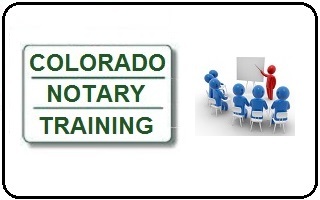 See Colorado Notary Training Class Dates above. We offer private notary training classes at your location, or by teleconference or webinar, for banks, credit unions, financial services, insurance agents, attorneys, law firms, paralegals, law enforcement, and other businesses, schools, colleges or government agencies that employ notaries. You choose the date and time and provide the training room. No special equipment is required. We teach the training class and bring the student booklets. Price includes tuition, 36-page student booklet, notary exam study guide and training completion certificate. Travel fee: $0.50 per mile, round trip, for car travel outside of Colorado Springs. Choose remote training by teleconference if you prefer or cannot attend classroom training due to your schedule, long distance, or winter weather, See Colorado Notary Training Class Dates above. We will call in to the teleconference phone number you provide. Or, you call in to our teleconference phone number and access code that we provide. It is not a toll-free number. You are responsible for any long distance charges or billable minutes that apply to your phone call. You may wish to use a land line, cell phone or Skype plan with unlimited minutes. Student booklets will be provided as a password protected PDF file before training. One copy may be printed for each paying student. We will follow the student booklet page numbers during class. © Copyright ABC Legal Docs, LLC All Rights Reserved. Our notary training class presentation and materials are protected by federal copyright laws. Audio or video recording is prohibited. DO NOT COPY training materials. Note: Adobe Acrobat Reader version 7.0 or later is required to open the PDF file. Training class completion certificates will be sent by email after class. Students will need to send a legible copy of photo ID by fax or email. Make a copy of your ID on a copy machine and lighten the copy settings so that it is clearly legible. Then fax or email a clear copy. If we cannot read the copy of your ID, you will have to send it again. Choose online notary training if you prefer self-study at your own pace, at any time that is convenient for your schedule. Our 60-minute Basic Colorado Notary Training course includes you everything you need to pass the open-book Colorado Notary Exam. Notaries may complete the optional Advanced Colorado Notary Training course to strengthen knowledge and learn how to handle more difficult and unusual documents and situations. Our Notary History course provides interesting and educational content on the changes and evolution of notary powers and roles from Ancient Egypt, Greece, and Rome, the Middle Ages, through the discovery and conquest of the Americas, colonial and territorial notaries, up to electronic notaries in modern times. Our Basic Colorado Notary Training course will prepare you to become a notary or to renew your notary commission and take the online Colorado Notary Exam. No prior legal background is required. Notaries do not give legal advice or draft legal documents. All students receive a 36-page Colorado notary training booklet, which serves as a valuable notary reference guide for daily notary work, as well as learning notary procedures, and useful notary tips. Students also receive a 4-page Colorado notary exam study guide to prepare for the online, open-book notary exam, to become a notary or to renew your notary commission. Students will learn basic Colorado Notary law and how to apply to become a Colorado Notary or to renew a commission. Current, expired and renewing Notaries will benefit from the review and tips for avoiding common mistakes and problems. Marketing ideas will show how a mobile Notary or Notary Signing Agent can become a notary, work from home to earn part-time income, or build a business or career. Students must bring a current driver’s license or photo ID to class. Students will receive a Certificate of Course Completion upon successful completion of the notary training. Independent notaries, attorneys, law firms, paralegals, court reporters, accountants, tax preparers, secretaries, clerks, office managers, health care, elder care, medical clinics, financial advisors, insurance agents, real estate agents, contractors, car dealers, law enforcement, legal process servers, human resources, mailing services, hotels, apartments, banks, lenders, title companies, school employees, government employees. Demand is increasing, as the Colorado population grows, more people need notaries for estate planning, medical, real estate, loans, business and other legal documents. Fill out your notary application form online, pay the application fee online and attach the required documents. Once you submit your documents online to become a notary, you should normally receive a reply from the SOS within a few business days, approving your notary commission. Once you know your expiration date, you can order a notary stamp. Order your Notary supplies and equipment, such as business cards, a Notary journal, a rubber stamp, inkless thumbprinter pad, inkjet and laser printer toner cartridges, office supplies, and Notary books from our Notary Supplies page. We recommend the Colorado notary journal sold by the American Association of Notaries (AAN) in Houston, TX. Jerry Lucas is an active Colorado Springs mobile Notary Public, Certified Trusted Notary, a member of the National Notary Association (NNA), American Association of Notaries (AAN) and CEO of ABC Legal Docs, LLC. He is an experienced instructor and has taught several subjects for Colorado Free University in Denver, Colorado Springs School District 11 Community Education, the Apartment Association of Southern Colorado, and the Colorado Springs Small Business Development Center (SBDC). He attended the University of Pittsburgh, the University of Massachusetts and the University of Colorado. He is a former a computer design engineer. He is a graduate of Leadership Pikes Peak and has served as a volunteer officer and board member for several organizations, including the Colorado Springs Police Department. For current Colorado notaries, take our Advanced Notary Training course to increase and broaden your notary knowledge and skills. Subjects include notarizing wills, trusts, Power of Attorney, oaths, the Bill of Rights, The Constitution, foreign language documents, apostilles, discrimination, disruptive customers, security, advertising regulations and more. Our Notary History Course provides interesting stories and educational information about notary history including Ancient Sumer, Phoenicia, Egypt, Greece, Rome, Tiro the Notary, notaries and the Church, royal notaries, the Middle Ages, Knights Templar, Spanish Conquistadors, French expeditions, New England colonial notaries, the fur trade, Colorado Territorial notaries, Indian tribal notaries, and more, up to modern-day electronic notaries. Please call (719) 591-0433 or send an email with any questions.